Remember my post about "the new gray"? You can click here to refresh your memory. 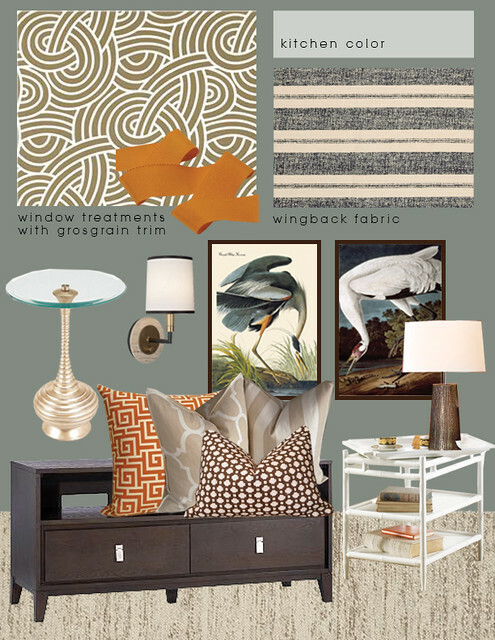 Well, when the room pictures came over for this design board I knew this color would be PERFECT in the space. The e-decorating client loved the paint. Success! Wow, I love this inspiration board, perfection!! I love your "new gray", millstone gray! I used it on my own inspiration board for our master bedroom, and the hubs likes it. Thanks, Bryn! Those birds steal the show! Love the composition of them and the color palate. And I'm dying over that orange grosgrain. That one is smoking...for real...love the three fabrics together. I love the gray with the orange. The bird prints and the curtains are my fav! Great design board! Hey there! I started reading your blog simply because of your name...my daughter shares the same name! Anyway, I just repainted most of my house grey and I've been searching for fabric to recover a chair. I love the one you picked for your client's wingback. Do you mind sharing where you found it? Thanks! Love your blog! Where on Earth did you find those beautiful bird prints? I'm looking for something in our entry hallway and these would be perfect. Thank you! They are from art.com. This is beautiful. I am sucker for anything with birds, so I, especially, love the bird prints. Where did you find them? I love the pillows! Where can I find some just like it? You have fab taste! I abolutely love that gray color! Everything you've chosen for the space is so elegant. Love it! Gray can be really beautiful when it's styled correctly. I would say that you have done it quite well! I LOVE that glass end table! I hope you have a great day!